Join us for our 12th annual Sherbrooke Village Road to Stanfest Songwriters’ Camp, July 22 to 25, 2019. Improve your abilities in the art, technique & craft of songwriting while learning from the best! Come to the shores of the beautiful St. Mary’s River for a songwriting experience. There will be songwriters’ circles, evening jams and a Grande Finale Concert at St. James Presbyterian Church at 7 pm on Thursday, July 25. Tickets at the door. On Thursday July 25 at 7 pm we will present a Grande Finale Concert at St. James Presbyterian Church within Sherbrooke Village, featuring the great music and talent of our instructors and pupils. Tickets for this evening’s concert will be available for $10 at the door, everyone is welcome. Stay an extra night FREE! 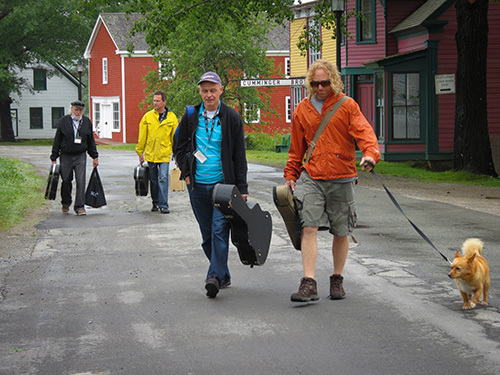 Stay over on Thursday night to make a fresh start on to Canso for the Stan Rogers Folk Festival on Friday Morning. Improve your abilities in the art, technique & craft of songwriting! Come to the shores of the beautiful St. Mary’s River for a songwriting experience. There will be sing-a-longs, songwriters’ circles and campfires by the river. A group session is scheduled for each morning with smaller classes throughout the day and are structured to meet a range of skills and levels of experience. Songwriters at all levels will have the opportunity to study the various styles of our instructors. The atmosphere at our learning centre is casual. There is easy access to wooded walking trails, with river swimming on the property. The summer climate can vary from warm and sunny to chilly, cloudy and wet, so be prepared to layer with t-shirts, sweaters, shorts and pants. For all music workshops, participants are required to bring their own instruments, paper, strings etc. A recording device would be most useful. Timetable, schedule and session information will be distributed when you arrive. Please bring your own musical instruments if you play. On-site accommodations for participants will be in our Hands on History building which is a hostel type house by the river - accommodations are dorm style with shared rooms and bunk style beds, please be advised to bring your own sleeping bags and pillow. You may also bring air mattresses for additional comfort. Meals are included for Monday lunch to Thursday dinner if personal diets allow. Breakfast is continental, we will supply food and you are on your own. We have great cooks here to prepare lunch and dinner, they’ve been feeding groups of school kids, teachers bus tours and visitors for years. All meals are home style country fare. Diabetic, vegetarian and any diet that allows you to eat from the meals provided can be accommodated at our restaurant. All other special diet requirements must be looked after by the individual. Refrigerator & kitchen facilities available at lodging building to store & prep your own food. The Village itself is a very special place which lends itself to some great musical and artistic expression. We are a 45-minute scenic drive south from Antigonish along highway #7 or 3 hours east of Halifax on highway #7. If you are heading to Stanfest it is 115 kl east of us. Find it on Google Maps. When you register, please indicate on the registration form in the space provided your level, writing experience & ability. Songwriter’s classes are geared to those who have had at least 1-2 years of experience (novice) to advanced songwriters. Courses are directed toward serious students who wish to explore songwriting at the intermediate & advanced levels. Involvement in group opportunities is strongly suggested and will help you build on what you will learn at camp. Classes will be taught at a level which is appropriate to the participants involved and may include various levels. NOVICE: You have 1-2 years’ experience and knowledge of the basics. ADVANCED: You are an experienced musician who learns quickly. You are able to learn the advanced aspects of various styles. Our intention is that all participants will have the opportunity to work with each instructor. We cannot accommodate specific requests for instructors or instruction.